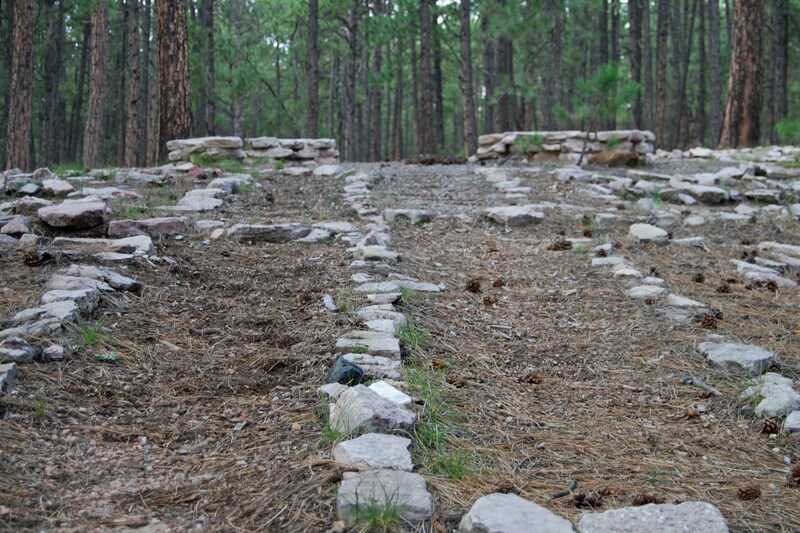 Recently, within a twenty-four hour period I climbed the “Incline” and wandered a prayer labyrinth. The juxtaposition intrigued me; two paths could not be more different. 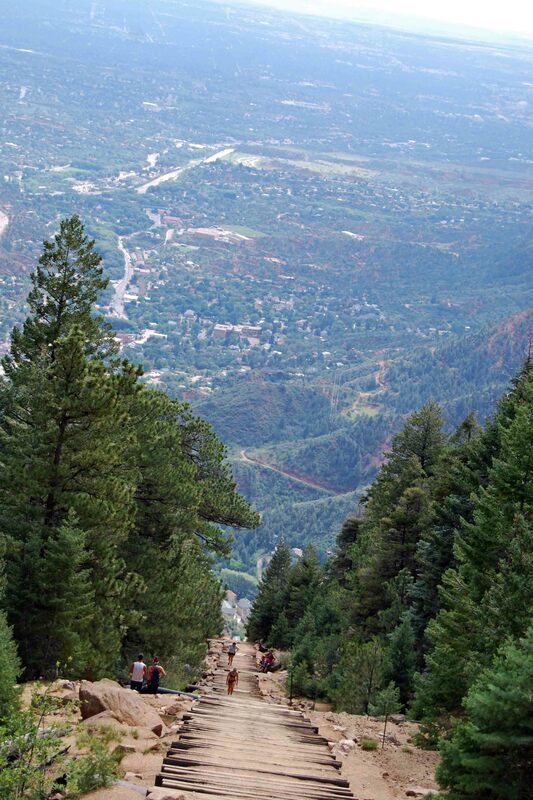 The one-mile Incline hike ascends from Manitou Springs at an average grade of 40%. Formerly a tourist cable car route, it slices straight up a mountain, visible across Colorado Springs. Rails have been removed, but railroad ties remain like a staircase up the slope, a siren call for those who crave physical challenge. The popular hike draws every type of person, from moms who just dropped off kids at school and covet a task that can actually be checked off as “finished,” to yoga masters who run the trail barefoot, and once at the top, balance on one leg facing the sun. Some climbers collapse at the summit, simply grateful to finish. Others race its course multiple times daily, striving to achieve faster and faster times. When I take the first step, reaching the top is a challenging but realistic conquest. I ascend leisurely, enjoying conversation with a friend and regularly turning to marvel at the stunning view. Certainly the trail tests muscles and oxygen absorption, but there is an end in sight and stamina can be apportioned for each step along the way. Even though the false summit befuddles the uninformed, training my eyes on it as the first goal and then to the top as the second destination urges straining muscles forward. The climb is a kaleidoscope of sights and sounds. Chipmunks swish under rocks. Lizards scurry across railroad ties. People toss companionable greetings to others, stopping to grab a breath. Rusty edges of old culverts clip the path. The sun bakes, and sweat drips down our backs. A cerulean blue sky beckons, promising that standing on the top is possible. Scaling the summit, I feel a surge of accomplishment. The stunning view of Manitou and Colorado Springs, sprawled at our feet, rewards us handsomely. My friend and I settle on a rock in the late summer sun and soak in a rush of endorphins. 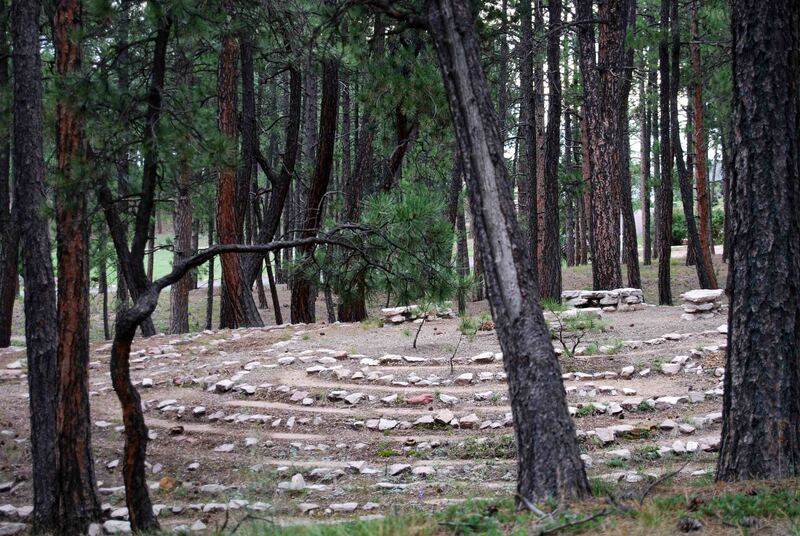 The prayer labyrinth, however, snakes through an obscure forest. You have to know exactly where it is to find it. If you were to stumble upon it uninitiated, it would take a few moments for your eyes to make sense of this strange pattern of rocks and pine needles. Buried amongst tall trees lacing across patches of sky, the muted interplay of stone and gently sloping hillside slowly settles into a discernible rhythm. I stand at the entrance and take a deep breath. I feel my hungry heart. Then I step onto the path, winding side-to-side and around. There are no choices to this passage, just one way to the middle. At the very beginning, I approach the central benches; but the rocks spin me out again to the outer edges. I never know where I am in relation to the beginning and the end. Staying between the lines focuses my eyes and my mind on an 18-inch span. 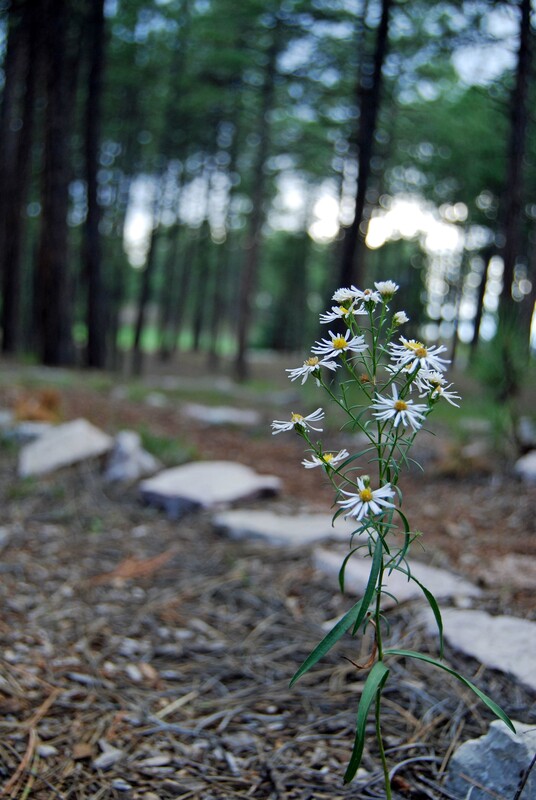 Every flower, tree trunk, pine cone takes on significance. Winding in, my heart unwinds. Longings suppressed rise to consciousness. Wounds surface, like paint that weathers and chips in the rain, exposing dry and rotted wood beneath. Quietly sulking bitterness, masquerading as acceptance, is revealed for what it is. I am compelled to pause, to lean against a tree and feel the flecks of sunlight playing on my eyelids. Deep calls out to deep. The labyrinth is like time flowing on. I am somewhere in it, though I don’t know where; it loops back on itself, then spews me into a new section. Then suddenly I am there. I reach the center. I know God is near. I turn the pages of my Bible, absorb the Truth of who He is. Like emerald grass washed by rain, growing in deep wet black soil, my heart is at peace, drenched in hope, basking in the gift of His Presence. Maybe like me, you are prone to yearn for Inclines, journeys with specific beginnings and endings. I long for paths I know will lead to success, challenges I am confident I can conquer, friendly companions on the way to distract me from the strain, spectacular views to reward my effort. 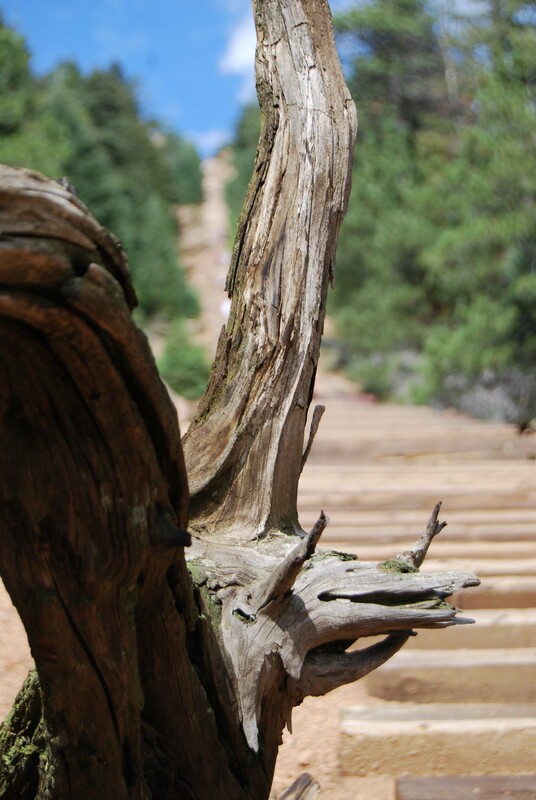 How few experiences in life are actually like the Incline. Most are a labyrinth. I want to skirt the edges of these routes, admire their intricate patterns, and run away in search of adventures I can control. But, even if I try to flee, somehow the labyrinths always find me. Are you lost in a labyrinth? Are you longing only to know where you are in relation to beginning and end, to find the way out, to crest the summit? Let me humbly challenge you to receive the labyrinth, to willingly submit to the trek with a heart hungry for God. The longest, most perilous, and ultimately the most important journey is our pilgrimage into the Presence of God. The slower, the more deliberately it is walked, the more profound the recompense. Beautifully written. That last sentence is so true. We can’t rush through our time with God or rush through with life without losing so much along the way. I am intrigued by your picture of the actual prayer labyrinth. It looks so peaceful and strangely deserted. I would love to go through it. Ahhh yes, I grew up on hearty doses of John Denver’s songs. They make my cry now, as they take my right back to my Dad, who loved his music and played it often in our house. Colorado is a magical place, and John Denver captured its intrigue.